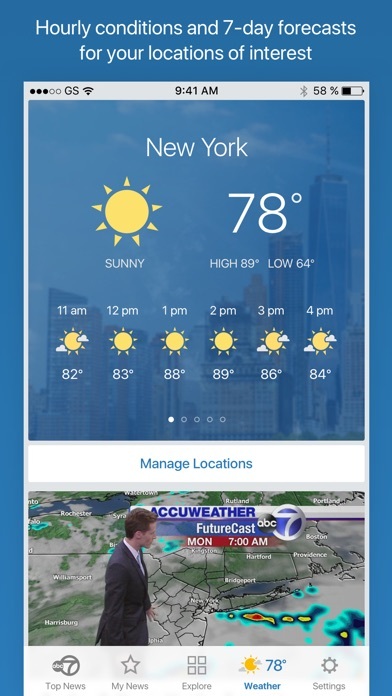 The ABC7 app provides the latest local, weather and national top stories and breaking news customized for you! Get more live and on-demand video than ever before, including live newscasts, and choose customized alerts based on your interests. Customized “My News” that matters to you - Stay informed on stories you love by choosing customized topics. 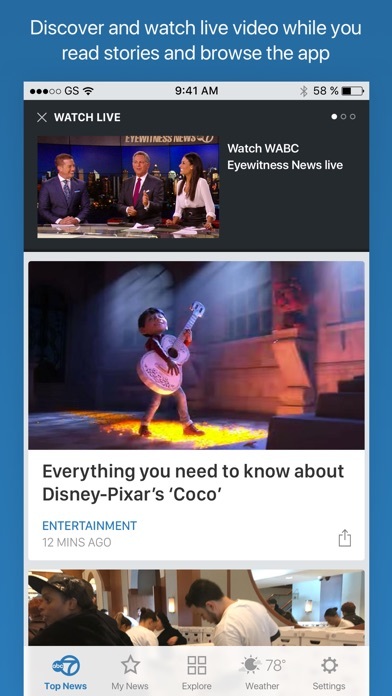 - “My News” builds a unique feed just for you based on interests and locations you choose. - Stay updated on the latest through live video, real-time updates and easy navigation. Get alerts you want - Choose customized alerts for topics and locations you care about, from entertainment news to sports updates and everything in between. 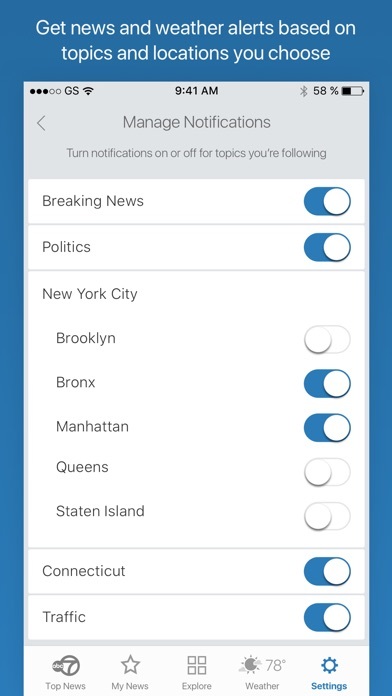 - Easily select locations in “Settings” to get the latest breaking news, weather and traffic from your area in real-time. 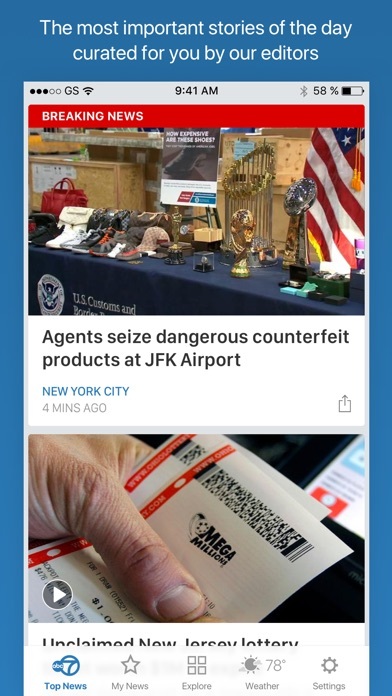 Watch live video - Find exclusive video clips and live video streams at the top of the app, including live news broadcasts. - Switching between live streams is as easy as flipping between channels. - Watch live video while you read stories and browse the app Stay updated 24/7 on weather and traffic - Easily choose your locations to get hourly conditions and 7-day forecasts. - Get real-time Doppler maps along with detailed weather information from Accuweather. - Get weather and traffic alerts for severe conditions so you’re always up-to-date before you go. Before you download this app, please consider that it includes advertising, some of which may be targeted to your interests. You may choose to control targeted advertising within mobile applications by using your mobile device settings (for example, by re-setting your device's advertising identifier and/or opting out of interest based ads). 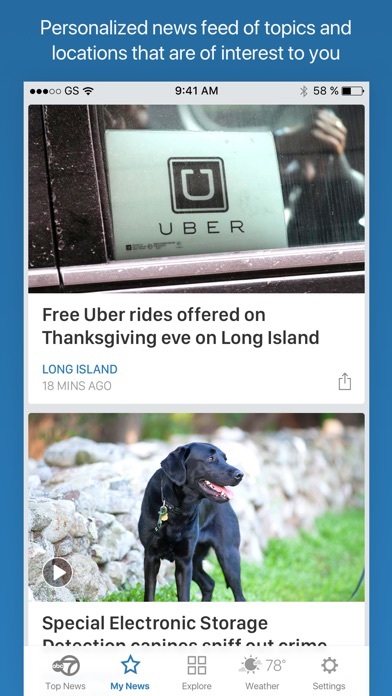 This app was great but now it freezes and crashes in the middle of stories. Also some of the articles are a month old. Please fix it. App shuts down or freezes up in the middle of reading some stories. The app was great until they just decided to play videos and commercials with sound without asking. I wanted local news but have deleted abc. This app is too complicated, it was better the way it was. People can’t leave well enough alone. Fake news, Atheist Bolshevik Commies. Fake phones Frauds, all of you. This app is awful. I’ll be in the middle of reading and it will shut down. Happens quite often. What good is a spreadsheet for salmonella when you can’t see the store? What’s wrong with you people? App keeps crashing!!! Won’t load feedback form to report problems Other problems too. The app needs a fix but it appears they aren’t doing anything to fix it!!!! Lately it’s been crashing a lot and now my phone is overheating while reading or trying to read the news. Sometimes under the tab “my news” i get stories 2 to weeks old. Like to day i went there and saw a story from march 25 come up. I think you could do a better job. I love this app, I use it multiple times a day and that’s not an exaggeration. However, for the past 2 days it’s been crashing as I’m reading the news. Please fix whatever might be causing the app to crash. I’ve always gotten my news from ABC7NY but I’m about to move on!!! Every time I’m reading a story it shuts down!!! If this isn’t fixed quickly I’m done!!! The feedback page won’t even open up!!! I guess they’re afraid to read news about themselves!!! Since the last update, your app keeps crashing. Please do something about the commercial that automatically opens. This is very frustrating that one must constantly silence or close the ad each & every time you read an article. I loved the app and its my go to news apuras but for the past 3 updates of the app, I have not been able to use it. I try to open the app and it crashes to the home screen. Please help!!! On time news reporting, alerts to keep me up on everything!!! Weather reporters Amy Freeze, a friendly face!!! All the reporters and Ryan Fields forecast are great. I look forward to “field forecasts “ and great reporting! Thank you for your great app!!! Why am I only able to see the videos in portrait mode? There should be the option of viewing the video also horizontally. Otherwise the app seems fine so far. 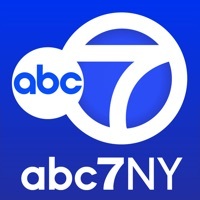 Good-bye channel 7, WABC. Can’t stand Amy doing the midday weather. The rest of the news and wether team are outstanding. Too many ads...dis some 🐂💩!!! Can’t finish without having to go back up.Keeps scrolling to end .So frustrated sometimes I just stop. What happen to Bill Evens? This upgrade is vexing! The videos playing automatically are presumptuous. I spend more time trying to turn them off then enjoying the article. Because I have to backtrack from the article to the video and turn it off. Really considering deleting this app, which is unfortunate. And get rid of the old news updates on the feed. Great app easy to find news and weather whenever I want. Love this app but the last few days it’s been crashing, not able to watch any videos. Please fix ASAP! It’s really great to get up to the minutes news . I love ABC news! I have counted on your Weather Reports. But now Accuweather came on with the advertisement sound; so I cannot get the weather report. All the time! Please fix. Otherwise I shall go elsewhere. This used to be a good app, however for several months it’s more of an inconvenience to open and to receive the articles. Very poor! This app is so unstable that it shuts off as I’m reading a story.. I’ve reinstalled it numerous times because I like Channel 7 news but this is ridiculous. It’s also full of typos on a regular basis. Too bad ...Also... why isn’t the news presented from most current to old .. I enjoy the the news stories however I have been experiencing major glitches when I attempt to listen to your videos on the app. When I click a video to hear reporting sometimes I will hear an ad playing simultaneously. Right now when I click a video I hear no audio. Please fix!!! Most times this app will not open. A beautiful coverage of news & weather report, enjoy the coverage especially while making a road trip local & out of state travelling in a car.!! !